Dra. 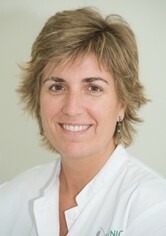 Marta Sitges Carreño is a Senior Specialist at Barncaclinic, specialized in Sports Cardiology. She is in charge of the Working Group on Sports Cardiology and is a member of Dr. Josep Brugada´s cardiology team. Analysis of cardiovascular adaptation to chronic training: ¿Basis of pathogenesis of cardiac arrhythmias?